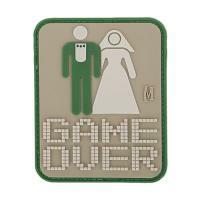 The "Game Over" Morale Patch from Maxpedition is the perfect groom gift. Made from durable PVC rubber and precision-cut for a three-dimensional effect, the patch is guaranteed to stand out. It comes with a hook-backing, making it perfect for customizing any piece of equipment with a loop field, including many Maxpedition bags. If there isn't a loop panel on apparel or gear bags, don't worry. Maxpedition's patch includes an additional loop field lined sheet that can be sewn onto clothing or equipment, granting a more permanent wear option. 5 Point Star Badge - B1280 - 3" x 3"